ST. LOUIS A bowl of turkey chili at a St. Louis-area Panera Bread (PNRA) cafe will cost you a penny. Or $5. Or $100. In other words, pay however much you want for the meal. Three years after the company launched the first of five pay-what-you-want cafes, the suburban St. Louis-based chain on Wednesday began its latest charitable venture that takes the concept on a trial run to all 48 cafes in the St. Louis region. The new idea experiments with a single menu item, Turkey Chili in a Bread Bowl, available at each St. Louis-area store. The new chili uses all-natural, antibiotic-free turkey mixed with vegetables and beans in a sourdough bread bowl, and has a suggested $5.89 price, which includes tax and is only a guideline. All other menu items are sold for the posted price. Panera calls it the Meal of Shared Responsibility and says the potential benefit is twofold: Above-the-cost proceeds go to cover meals for customers who cannot pay the full amount and to St. Louis-area hunger initiatives; and for those in need, the 850-calorie meal provides nearly a day's worth of nutrition at whatever price they can afford. "We are launching the Meal of Shared Responsibility because we know that one in six Americans - over 50 million people nationwide - are food insecure, meaning they have limited or uncertain access to adequate food," said Ron Shaich, founder, chairman and co-CEO of the chain and president of its charitable arm, Panera Bread Foundation. "We hope the suggested donations offset those who say they only have three bucks in their pocket or leave nothing," said Shaich. If the experiment works in St. Louis, it could be expanded to some or all of the chain's 1,600 bakery-cafes across the country, though Shaich said there is no guarantee and no timetable for a decision. Panera has long been involved in anti-hunger efforts, starting with its Operation Dough-Nation program that has donated tens of millions of dollars in unsold baked goods. 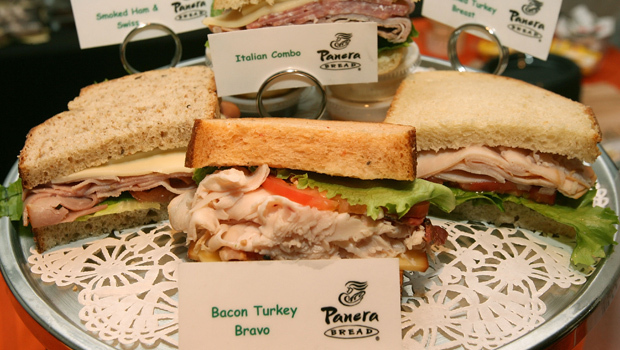 The first pay-what-you-want Panera Cares cafe opened in the St. Louis suburb of Clayton in 2010. Others followed in Detroit, Portland, Ore., Chicago and Boston. At those nonprofit cafes, every menu item is paid for by donations. The company said in a statement on Wednesday that in 2013, it estimates more than 1 million people will eat at the five Panera Cares cafes. Kate Antonacci of Panera Bread Foundation said roughly 60 percent of customers pay the suggested retail price. The rest are about evenly split between those who pay more and those who pay less. The Panera Cares cafes generally bring in 70 to 80 percent of what the traditional format stores do, said Ms. Antonacci. That's still enough for a profit, and Panera uses proceeds for a job training program run through the cafes. The new idea is fairly low-profile. Shaich said Panera is relying on media reports and word of mouth - no direct marketing, no advertising. Signs in the St. Louis cafes will tout the idea, and hosts and hostesses will explain it to customers. "We don't want this to be self-serving," said Shaich. "We want to make this an intellectually honest program of integrity." Panera isn't alone. A restaurant known as One World Everybody Eats in Salt Lake City adopted the pay-what-you-want idea a decade ago. Cafe Gratitude, a small vegan cafe chain in California, offers a single payment-by-donation menu item each day. Software known as freeware is frequently distributed under this model. The rock band Radiohead released an album, "In Rainbows," in 2007 and let online buyers decide how much to pay. Humble Bundle releases video games as pay-what-you-want downloads, with a percentage of money going to charity. It doesn't always work. Yogaview, which operates three yoga studios in Chicago, tried a donations-only format at its Wicker Park studio for nearly two years before turning to a traditional payment method. Co-owner Tom Quinn said that while many customers were generous, too many others were not. "You'd get a class with six people and there would be 12 bucks in donations," said Quinn. "It got frustrating to see how some people weren't owning up to it." A study published in Science magazine in 2010 found pay-what-you-want customers will pay substantially more if they know a portion goes to charity. But that same study, led by Leif Nelson of the University of California, Berkeley's Haas School of Business, found that inclusion of a charitable component made people less likely to buy - possibly, Nelson said, because they stressed over the appropriate amount of generosity. "There is some concern that turkey chili will simply become a little less popular," Nelson said of the Panera experiment. "On the other hand, I think that those who choose to buy it will be reluctant to pay low prices." Shaich is optimistic based on what he's seen firsthand. He worked at the opening of the Clayton store, making food and waiting on customers. He saw well-to-do frat boys leaving without paying a dime, but more often, he saw people being generous. Even those clearly in need dug into their pockets. "A lot of cynics think Americans are just gaming the system," said Shaich. "Our experience is very different. People do the right thing and are willing to take care of each other."